Bundled with Goldie is a specially-modified version of JsonViewer. This is not officially part of Goldie, but is included as a convenience. JsonViewer requires the .NET runtime. It has also been tested to run on Linux with Mono, but it's a little bit buggy that way. The original JsonViewer (available from http://jsonviewer.codeplex.com) is a tool written in C# for viewing JSON files (JSON is a text-based data file format and a common alternative to XML). 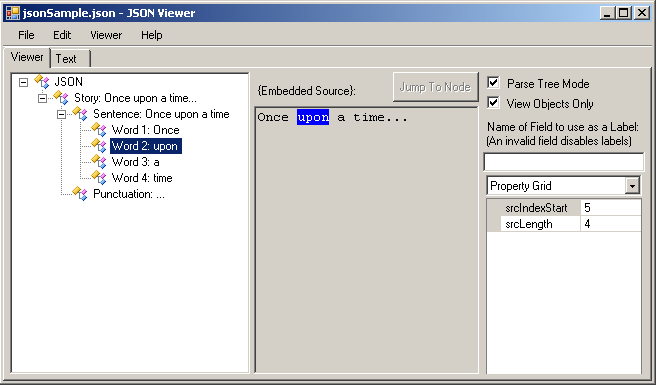 The version of JsonViewer bundled with Goldie still retains that functionality, but has been modified to include a special Parse Tree Mode for viewing a text document side-by-side with a JSON-based tree that describes the text. This is useful, for example, for viewing the JSON files that are output by Goldie's Parse tool. Using the Parse Tree Mode: Click a tree node in the left panel to highlight the corresponding section of text. Click a location in the text and then click "Jump to Node" to select the corresponding node. Source code and Visual C# 2008 Express project files are included. Note that unlike Goldie, JsonViewer is licensed under the Microsoft Community License (Ms-CL) v1.1. A from-scratch rewrite in D is planned. Note: This program has some trouble with very large JSON files. So when using it with Parse, keep in mind that parse trees tend to get very large, very fast. So try to use small source files with this.